Your gift purchase is a donation supporting CARE’s work. CARE delivers lasting change to some of the world’s poorest communities. We place special focus on working alongside poor women because, equipped with the proper resources, women have the power to help whole families and entire communities escape poverty. Because these are symbolic CARE Packages, there are no pesky shipping costs to pay and 100% of your donation goes to CARE! WHAT WILL THE PERSON I BUY A GIFT FOR RECEIVE? The person you buy a gift for will receive a card of your choosing. You can deliver it as an e-card that includes a personal message from you along with a photo of the gift you chose in their honor. You can also download a printable card to personalize and send. HOW DO I SEND THE CARD? Before putting a gift in your CARE Package you must select which method you'd like your recipient to receive their card. Customize the card with a personal message to the person you’ve chosen to honor with a gift of lasting change. Please fill in all of the required information. For each item, please enter only one email address in the email address field. If you’re sending the same item to more than one person, please select the item again and enter each recipient separately. Put another way, only one item can appear in an e-card. If you’re buying multiple items for the same person, you can send them one e-card for each item. Alternately, you can send one e-card with a personal note saying you bought several gifts. Click ADD TO CARE PACKAGE. Continue shopping or go to checkout to complete your order. We are working to add new e-card functions. Please email us at caregifts@care.org and let us if you have any suggestions about how we can improve the e-cards. After your purchase, select DOWNLOAD CARD in your web browser. A link to the printable card will also appear in the receipt CARE will e-mail you when you complete your purchase. If you download the card to a device that is not connected to a printer, save the card as a PDF file on the device, then send it to a device that’s connected to your printer. For more detailed instructions on downloading and printing a card, click here. HOW CAN I SHARE THE GIFT ON SOCIAL MEDIA? In addition to the e-card and printable card, you can share your purchase via social media. Just click the SHARE button after you complete your purchase. You can share the gift on Facebook, Twitter and Google Plus. WHAT DOES THE PRINTED CARD LOOK LIKE? WHAT DOES THE E-CARD LOOK LIKE? I FORGOT TO DOWNLOAD THE PRINTABLE CARD, WHERE CAN I FIND IT? A link to the printable card can be found in the invoice e-mailed to you after you purchase your gift. 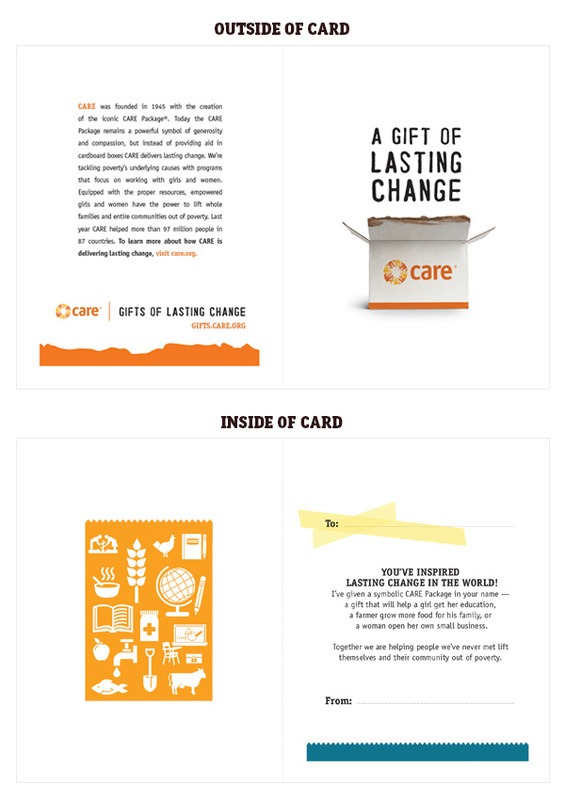 If you've registered a CARE Gifts of Lasting Change account, a link to your printed card can always be found in the Completed Orders section of your My Account page. IS MY GIFT PURCHASE TAX-DEDUCTIBLE? Yes. Your CARE Gifts of Lasting Change purchase is tax-deductible to the extent allowable by law. CARE is a non-profit 501(c)3 public charity. You will receive a tax-deductible receipt for all gifts larger than $5. Of course. To make a one-time donation to CARE, click here. To give monthly and multiply your impact, click here. You can also quickly donate from within the gift catalog by giving a Quick Gift. However you choose to donate, you will receive a tax-deductible receipt with your donation. HOW CAN I FIND OUT IF MY EMPLOYER WILL MATCH MY GIFT TO CARE? Many companies have programs through which they will "match" the charitable contributions made by their employees. Through corporate gift matching, your employer can multiply your gift to CARE, making it go further. I’M HAVING TROUBLE COMPLETING MY ORDER. WHAT SHOULD I DO? Email caregifts@care.org and let us know what the issue is. HOW CAN I LEARN MORE ABOUT CARE'S WORK? You can visit our website, care.org, to read stories and the latest news on what CARE is doing to fight global poverty. You can also join our mailing list, like us on Facebook and follow us on Twitter.